Hugh John Simmonds, CBE, turned up dead in the woods, outside of his home town, Beaconsfield, Buckinghamshire, in November 1988. $7.5 million was missing from his law firm, Simmonds and Company. The incident made international headlines: Simmonds had been Conservative British Prime Minister Margaret Thatcher’s favorite speech writer. However, this was not the first time Simmonds had attracted public attention. He had already made a name for himself publicly by becoming the only Prospective Conservative Parliamentary Candidate to be de-selected twice from safe Conservative seats: first, from South-West Cambridge, in 1983, when the Cambridge Hunt discovered his wife was anti-hunting; and then again in 1987, when the Association of South Warrington found out that Simmonds had an illegitimate son. However, all this unsavory press coverage belied Simmonds’ true influence in the British Conservative Party, where he was well respected by the voluntary, professional and Parliamentary wings. Simmonds was a former Treasurer of the Conservative Party’s Wessex Area (1982-1986), and served on both the Conservative National Board of Finance and the Party’s National Union Executive Committee. Some saw him as a future Chairman of the NUEC. In addition, Simmonds was one of the founding officers of the Selsdon Group in the early Seventies. It was the Selsdon Group which formed the launching pad for Thatcher’s successful bid for the Leadership of the Conservative Party in 1975. Simmonds was an honorary legal adviser to Conservative Central Office, and was regarded by all as a potential Cabinet Minister – as long as he could avoid his propensity to self-destruct. What was not generally known was that Simmonds was also a senior officer in MI6, and had specialized in legal money-laundering, at the London law firm of Wedlake Bell, where he had been one of its youngest partners, in the late Seventies and early Eighties. 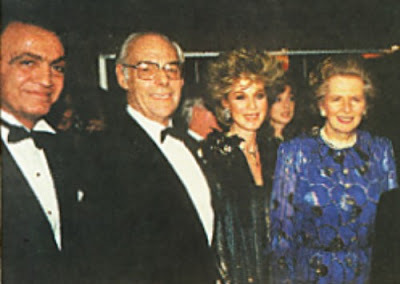 It was this combination of skills, experience and contacts, not least his personal closeness to Margaret Thatcher, that made Simmonds the ideal candidate to perform the clandestine arms functions, requested of him by Margaret Thatcher and the Conservative Party in the Eighties, and which form the subject of Cast Iron. Geoff Gilson was for 10 years active in the British Conservative Party, up to and including the national level. He trained as a lawyer, and pursued a commercial career in public relations. Currently, he is focusing on his creative interests, and resides in a small mill town in central North Carolina. He wrote the book 'Cast Iron: The Arms Trail To Margaret Thatcher,' and created this supporting web-site because he believes we deserve the truth about those we elect to trust. This entry was posted in Uncategorized and tagged Beaconsfield, Conservative, Hugh Simmonds, Iron Lady, London, Margaret Thatcher, Politics, Prime Minister of the United Kingdom, Selsdon Group, Tory Arms Corruption. Bookmark the permalink.